Chili Bean Turkey Pot Pie is an easy-to-prepare dish that combines ingredients of two classics, chili beans and pot pie. 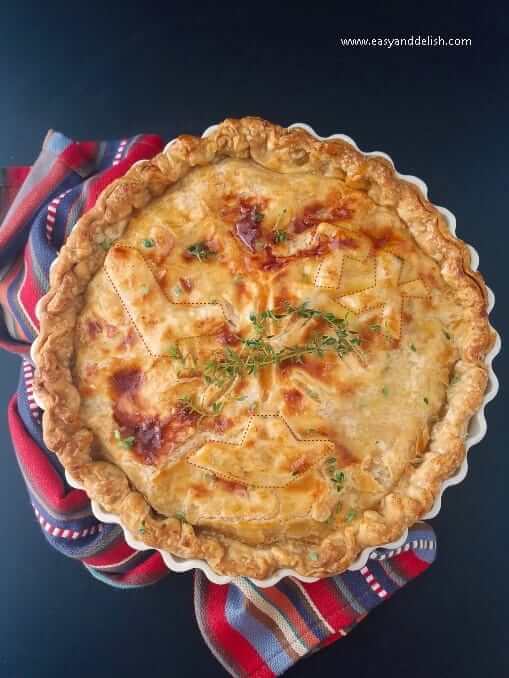 It’s basically made with leftovers encased in buttery, flaky pie crust resulting in a bold dish full of comforting flavors. Are you a fan of chili beans? 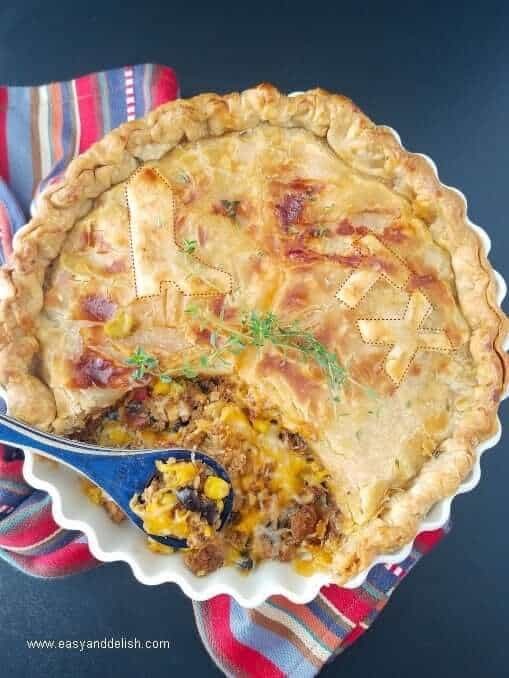 How about pot pies? My answer is YES to both. This Chili Bean Turkey Pot Pie will quickly become a favorite of yours too! It’s a complete meal that makes dinner an easy task, yet is interesting for its bold, comforting flavors. 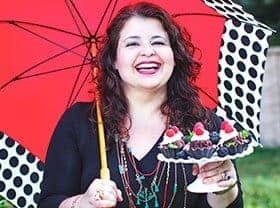 We used leftovers and what we had available in our pantry and fridge to prepare our pie. If you have turkey leftovers and pie crusts from your Thanksgiving feast and a can of beans, this is the dish to cook. 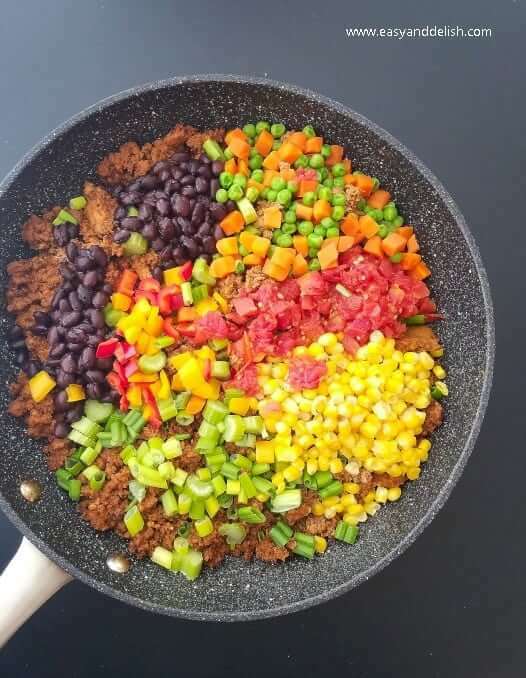 I simply sauteed a few vegetables in oil such as onions, celery, and bell peppers… and added canned diced tomatoes, canned beans, and steamed corn, peas and carrots. Then, we transferred vegetables to a plate so we could make use of the same pan to cook ground turkey with taco seasoning, chili powder, and white wine vinegar. 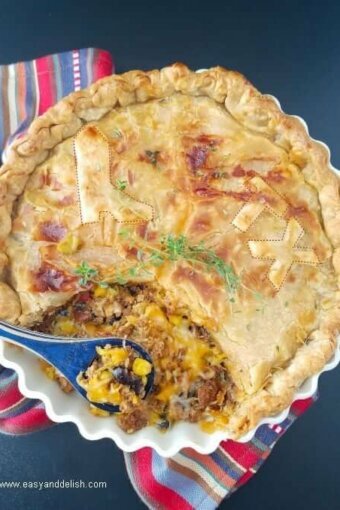 Cooked vegetables and turkey were mixed together with canned nacho cheese sauce, spooned into a pie crust, and topped with shredded cheese. The pie was enclosed with another pie crust and baked until golden brown. My family enjoyed this leftover pot pie with guacamole and fresh salad. … such as beans, chili powder, diced tomatoes, corn, and nacho cheese sauce which substitutes for the gravy in traditional chicken pot pies. Although the traditional chili bean recipe uses pinto and kidney beans simmered in a chili sauce, we used the beans we had in our pantry: canned black beans. So you know you can make use of whatever you have at home. Our Chili Bean Turkey Pot Pie turned out great, and is now on our list of favorite family meals. Even my eldest daughter, who is not crazy for chicken pot pie, loved this dish. In my opinion, it’s a clever spin on two classics. Well, are you ready to get started making it? Here we go! In a large no stick skillet, heat oil over medium heat. Cook onion, celery, and bell pepper for about 3 minutes, stirring occasionally. Do not let brown! Stir in canned diced tomatoes, canned beans, and steamed corn, peas and carrots. Transfer to a plate. In the same pan, cook ground turkey over medium heat for about 4-5 minutes. Add taco seasoning and chili powder and let cook for additional 2 minutes, stirring occasionally. Add white wine vinegar and cook for 1-2 minutes. 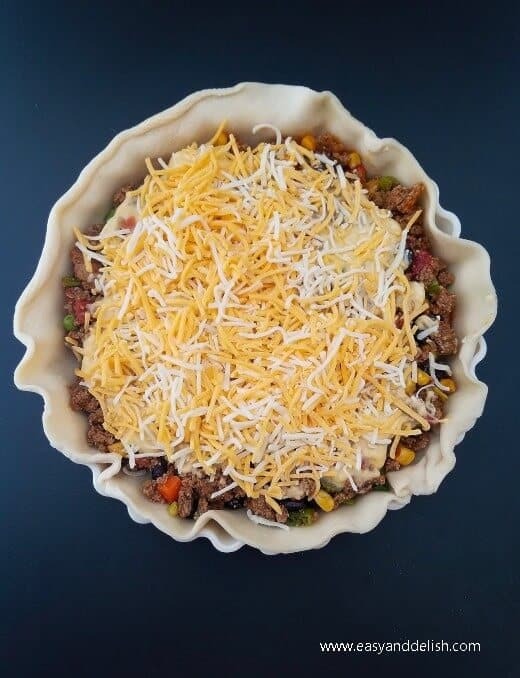 Add cooked vegetables to the pan, stir in nacho cheese, and spoon mixture into a 8-inch pan lined with a pie crust. Top with shredded cheese and then with second crust; seal edge and flute. Cut slits in several places in top crust. Brush top with a mixture of beaten egg yolk and heavy cream. Bake for 35 to 45 minutes or until crust is golden brown. During last 15 to 20 minutes of baking, cover crust edge with strips of foil to prevent excessive browning. Let stand 5 minutes before serving. Enjoy chili bean turkey pot pie topped with guacamole and a side of fresh salad. If using leftover cooked shredded turkey, quickly saute in oil with taco seasoning and chili powder, and then add vinegar, letting evaporate. Since shredded turkey is already cooked, it doesn’t need to follow the same cooking time stated in the recipe for uncooked ground turkey. Although chili beans (also known as chili con carne) uses pinto and kidney beans in its traditional recipe, you can use any type of beans you have available. For instance, I used canned black beans in mine. As for nacho cheese sauce, an ingredient present in Tex-Mex cuisine, it replaces the usual gravy used in the classic chicken pot pie, saving some prep time. I will leave you now with the magic formula for one hero of a dish! If you love twists on classics, try also our Mediterranean Chicken Pot Pie. It’s as delish and easy to make as our chili bean turkey pot pie. I will be awaiting your feedback! Chili Bean Turkey Pot Pie is an easy-to-prepare dish that combines ingredients of two classics, chili beans and pot pie. 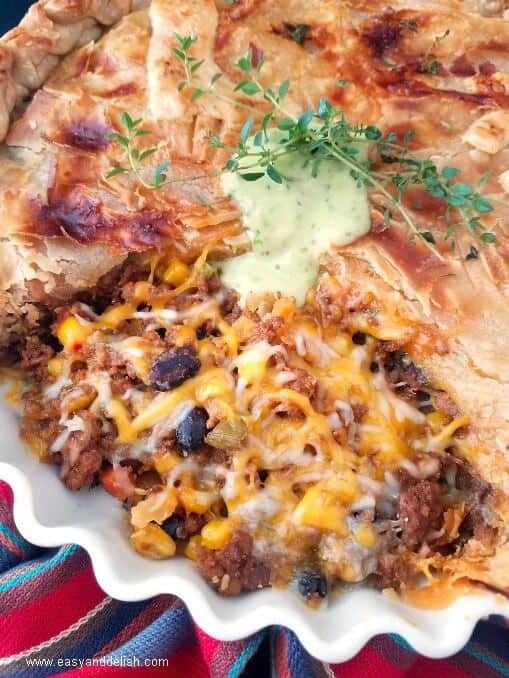 It's basically made with leftovers encased in buttery, flaky pie crust resulting in a bold dish full of comforting flavors. In a large no stick skillet, heat oil over medium heat. Cook onion, celery, and bell pepper for about 3 minutes, stirring occasionally. Do not let brown! Stir in canned diced tomatoes, canned beans, steamed corn, peas and carrots, and green onions. Transfer to a plate. 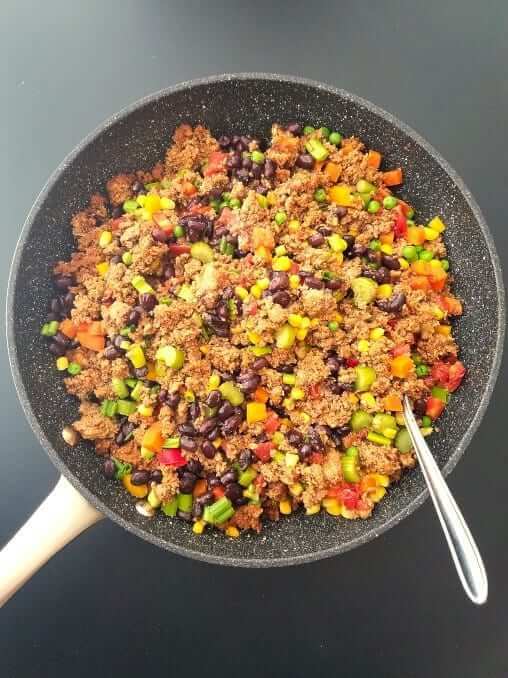 In the same pan, cook ground turkey over medium heat for about 4-5 minutes, add taco seasoning and chili powder and let cook for additional 2 minutes, stirring occasionally. Add vinegar and cook for 1-2 minutes. Top with shredded cheese and then with second crust; seal edge and flute. Cut slits in several places in top crust. Brush top with a mixture of beaten egg yolk and heavy cream. Bake for 30 to 40 minutes or until crust is golden brown. During last 15 to 20 minutes of baking, cover crust edge with strips of foil to prevent excessive browning. Let stand 5 minutes before serving. Enjoy topped with guacamole (and sour cream, if desired) and a side of fresh salad. If using leftover cooked shredded turkey, quickly saute in oil with taco seasoning and chili powder, and then add vinegar, letting evaporate. Since shredded turkey is already cooked, it doesn't follow the same cooking time stated in the recipe for ground turkey. Love Twist on Classics? Try our Mediterranean Chicken Pot Pie. This twist on traditional pot pie is a wonderful way to use leftover Thanksgiving turkey. I’ll have mine with a side of salsa.